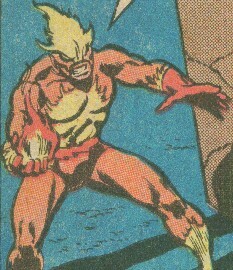 Powers/Abilities: Hotshot had the power to throw fireballs from his hands. 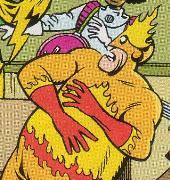 It is unknown if this power was natural or artificial, and it is unknown if Hotshot had any other pyrokinetic powers. ("Hotshot on the Block") - Spider-Man's old enemy (?) returned to once again cause trouble for the Wall-Crawler. After narrowly dodging some fireballs thrown by Hotshot, Spider-Man tossed down some delicious Hostess Twinkies. Hotshot couldn't resist the golden sponge cake and creamy filling of the snack cake and (being unable to throw fireballs and eat at the same time) Hotshot halted his attack to eat. Spider-man then ensnared Hotshot in a web and left him for local constabulary to pick up. (Fin Fang Four Return!#1/5 (fb) - BTS) - Hotshot was imprisoned somewhere in NY state. (Fin Fang Four Return!#1/5) - The robot Elektro, mistakenly identified as a villain and arrested, was ushered into the prison's S-Wing where he met various past Spider-Man villains, including Hotshot, who had now become overweight. Later, inspired by Elektro's defiance, he and the other inmates of S-Wing smashed their way out only to be subdued by the prison guards using sedation foam. Comments: Created by an unidentified writer and artist. 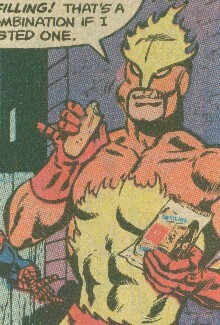 Of all the Hostess villains, only Icemaster has shown up in an Earth-616 title. He could have crossed over to Earth-616 from "Earth-Hostess," but I say leave them on Earth-616 until proven otherwise. Nonetheless, until they do show up in regular continuity, they remain outside regular canon. Surely someone will write a story teaming them all together.---Snood. You can get the whole Hostess story, and some clever commentary from Seanbaby's The Hostess Page. It might not meet with the Comics Code Authority's approval, so kids, ask your parents before checking that out! His real name was revealed in Elektro's profile in OHotMU A-Z Update 2010#2.